The cooperative society, Ekin, has signed an agreement with Industria de Turbopropulsores, S.A. (ITP) for the supply of disc machining broaches for the Rolls-Royce Trent 1000 and Trent XWB engines for the next 10 years. For David Bernar, director of the Aeronautical Division of Ekin, “the signature is the endorsement of a collaboration framework that began two years ago, when Ekin started to develop its high-performance broaches for these turbines. The contract represents a revenue of 40 million Euros, and the consolidation of around thirty direct and indirect jobs”. Ekin has earned the trust of ITP during the collaboration that has existed since 2015 thanks to its technical capacity and the supply quality of this type of high-precision and performance broaches. The cooperative has committed to continue moving forward with higher added value tools, by means of R&D projects that permit faster broaching and, in turn, ensure that the tools are longer-lasting. Ekin is currently responsible for re-sharpening all the broaches that ITP uses to produce turbine discs for Rolls-Royce. ITP is a leading company in its market segment. It is currently ninth in the ranking of aeronautical components and engines in terms of international sales, and it is also among the first ten companies of the aeronautical industry. The company has production centres in Spain, Great Britain, Malta, United States, India and Mexico, and a staff of more than 3000 employees. Among its activities, ITP includes the design, research and development, manufacture and casting, assembly and testing of aeronautical engines. With the Service Support segment, it provides services for a wide range of engines, accessories, components and parts. Its experience includes customers who operate on civilian, industrial and defence markets all over the world. It is also the official maintenance centre for the majority of engine manufacturers that exist in the world today. The Aeronautical Division of Ekin will invest 5 million Euros in equipment between 2015 and 2017. Ekin has decided to commit to its Aeronautical Division, whose facilities at its Amorebieta plant (Vizcaya) cover an area of 500 square metres today, a surface area that has doubled that earmarked for its activity within just one year. An example of the development of this activity is that, in 2016, the aeronautical business area reached a turnover of over 2 million Euros, more than treble the figure corresponding to the previous year. 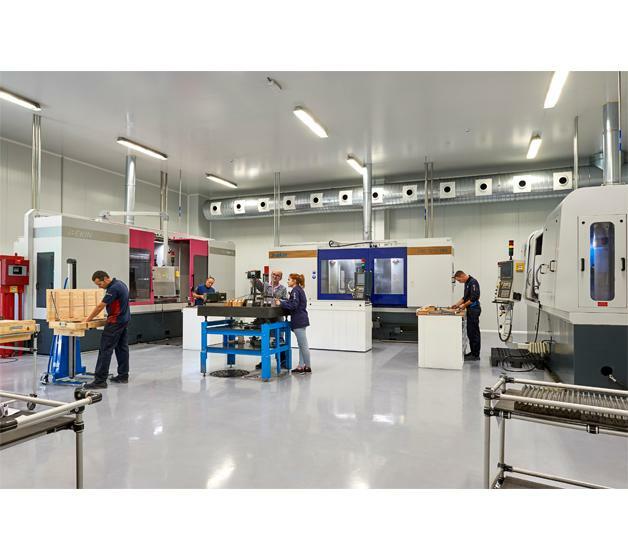 Within the aeronautical field, the Amorebieta firm has specialised in high-precision machining of critical components for aeronautical turbines. With the current facilities, the division has the capacity to produce more than one hundred sets of broaches a year for the aeronautical sector where it carried out its first work at the beginning of the century for General Electric. Its growth perspectives in this sector are based on its own broaching technology developments, which lead to a highly considerable reduction in process time, thus representing a very important competitive advantage in the market. Currently, Ekin Amorebieta has a total staff of 205 people, of whom around thirty direct and indirect people form part of the aeronautical division. Its evolution in this sector is fruit of the strategy adopted by the cooperative, which was founded in 1963, and which was integrated into NerGroupin 2008. If, in 2009, sales in the aeronautical sector amounted to 100,000 Euros, the estimates for 2020 place them at 5 million Euros, exceeding the current 15% consolidated turnover of the Ekin Group. In this strategy it contemplated, on the one hand, the internationalisation of the activity in the automotive sector, which has traditionally accounted for 95% of its production. The rest corresponded to a diversification initiative in the aerospace and energy areas. In another step towards strengthening its activity in the aeronautical environment, Hegan, the Basque Country aeronautical and space cluster, was incorporated in 2015. Integrated into Ner Group since 2008, the main activities of Ekin Sociedad Cooperativa are the manufacture of broaching and laminating tools and machines, as well as services related to them. With a total of five own centres on three continents (Ekin Amorebieta, Ekin Lemona -Bizkaia-, Ekin India -Gurgaon, Haryana-, Ekin Brasil –Gravatay- and Ekin México –Querétaro-) , a joint-venture in Italy (Ekin CDM –Milan-) and as administrators of AK Sorocaba (Brazil), it has a total staff of 360 workers.